The song "Set El Hosen" was written for Nagwa Fouad by Mohamed Sultan. He was the husband of famous singer Faiza Ahmed. The phrase Set El Hosen is a common phrase in Egypt. It is used to describe a woman who is prettier than most. It means (roughly) "Prettiest of the Pretty" or even "Queen of the Pretty". It does not mean "Beautiful Lady" as some people believe. There is an old Mohamed Fawzy/Nour el Hoda song called "Set El Hosen" which they sang in a film. That's a completely different song. 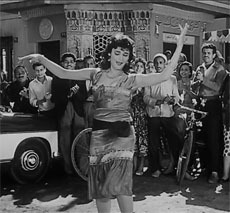 Mohamed Sultan's Set El Hosen doesn't have any lyrics; however, some background singers can be heard in the video of Nagwa Fouad's performance to the song. These are not really lyrics but rather they are just words repeated over and over: "Allah Esmalla, Allah Esmalla, Allah, Allah, Allah, Set el hosen halaaa." These are common words in Egypt — and in Arabic in general, for that matter, and people use them when they see something pretty. It's just an exclamation. "Set el hosen halaa" just means "the beautiful one has arrived". Esmalla or Smallah is just a protracted version of Bessem Allah. Another bit of trivia: "Set el Hosen" is also a character in Arabic fairy tales and in Arabic bedtime stories. Also, the belladonna plant (nightshade) is called "Set El Hosen" in Egypt. 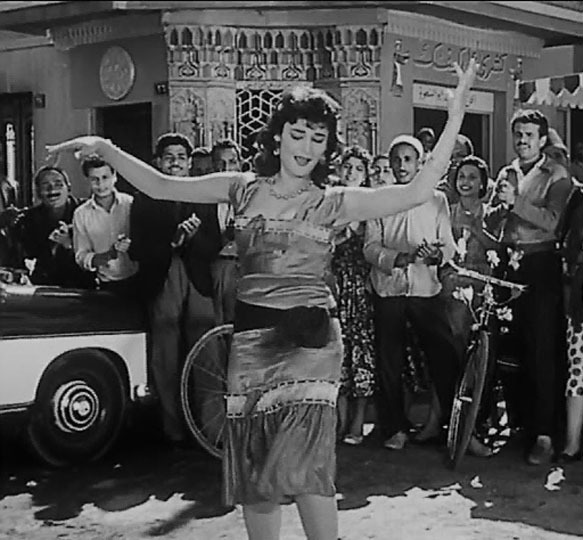 ABOUT THE PHOTO: This photo shows Nagwa Fouad dancing to the song "Oolooloo" in her silver screen debut, in the motion picture Sharia el Hob (Love Street).